Been given the impression that the only way to dress the windows of a garden room is with conservatory blinds? Forget the received wisdom. 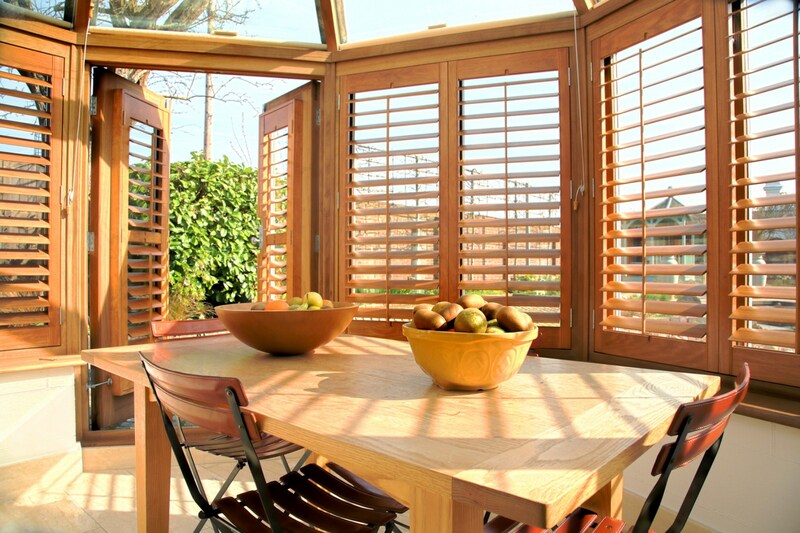 Shutters are as sleek, sophisticated and downright practical in a conservatory as in every other room. What’s more, a consistent window dressing for your home that looks good from inside and out is always going to trump introducing a contrasting one that lacks the same style credentials. Conservatory shutters can be fitted to both the room’s windows and roof, so there’s no need to mix treatments within the room either. With shutters, a smart and contemporary finish is simple. Worried that your conservatory includes some windows that aren’t standard shapes? No problem. Our shutters are made to measure for any shape of window, including angled versions. 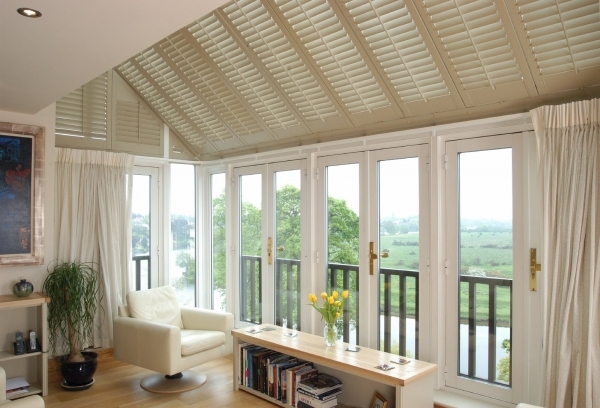 What are the other advantages of shutters in a conservatory? The adjustable slats of shutters allow fine control of the light coming into a conservatory throughout the day and on every aspect. This precision will also help keep the room at the right temperature on hot days, making the room usable all summer long. In winter, shutters are a good extra layer of insulation on the windows, too, so the space is comfortable to spend time in. 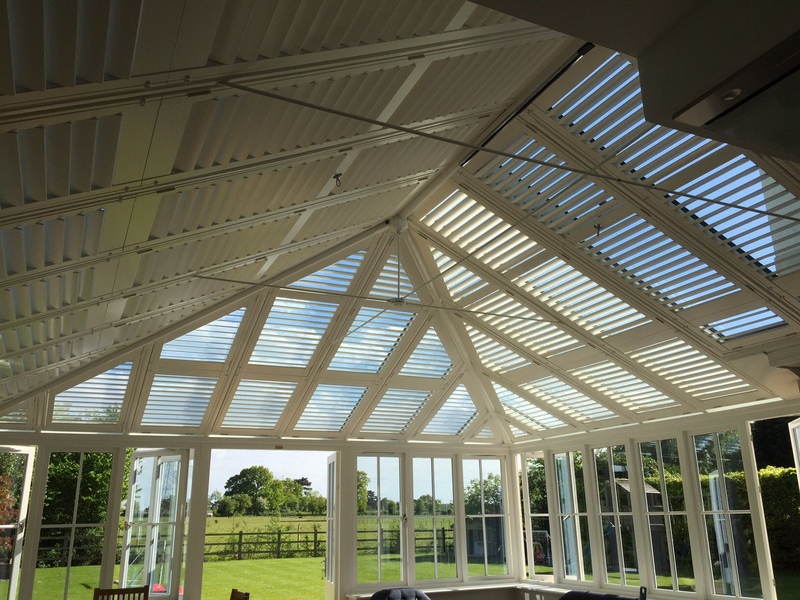 Conservatory furniture and floor coverings will also last longer with shutters fitted at the windows and for the roof as the damaging effects of the sun can be mitigated. Of course, the shutters themselves won’t deteriorate in the sunlight either, so they’re a sound investment compared to the cost of conservatory blinds. A decorating scheme for the conservatory that’s in harmony with the look elsewhere will help make your home a style heavyweight. Shutters in the conservatory as well as in other rooms will create a strong link, of course, and there are plenty of other ways to make rooms congruent. Eat-in conservatories If your conservatory is an extra dining room, think about repeating the trick of hanging pendant lights low over a dining table. The fittings don’t have to be the same, but consider using similar materials or finishes to make the link. When it comes to the furniture, repeating the aesthetic or materials from the dining space will also work. Alternatively, minimalists might want to think about emphasising the space and light of the conservatory with a transparent table and chairs. Like the idea of long get-togethers round a conservatory table? How about replacing some of the chairs with an upholstered bench for a hit of colour in the space and plenty of comfort. Living room conservatories In a conservatory that’s an extra seating area, why stint on comfort? A sofa that’s as sink-in and stretch-out as the one in the living room is a much more inviting choice than traditional conservatory furniture. Think about matching it to the look of the conservatory structure itself as well: the sleeker glass box your garden room is, the more streamlined the sofa should be. And with the protection of shutters, you needn’t worry about damage to fabric over time. Of course, if you do prefer the airy look of rattan furniture, there’s no need to go down a traditional path. Look for woven pieces with contemporary boxy shapes rather than old-school curves. Conservatory flooring Garden room floors are traditionally tiled or finished with another hard flooring, so it can pay to lay a rug to soften it. It’s also an opportunity to add an accent of colour that can be echoed in sofa cushions or lampshades. Concerned about the impact of feet straight from the garden on a rug? Opt for one labelled as an outdoor design that won’t be damaged by dirt or wet tracked in and is easy to clean. Lighting The weather won’t always do its bit in keeping the conservatory light, so supplement any pendant lights with a table or floor lamps so space is bright even on gloomy days. These layers of light will make the room welcoming after dark, too. Foliage plants They’re a classic accessory for conservatories, and one that’s simple to make look contemporary. For the biggest impact, group plants of different heights with contrasting foliage shapes. Here again, shutters will come to the rescue in managing sunlight so that leaves aren’t scorched, spoiling the display. Don’t forget, either, that our consultants will work with you to ensure your scheme and shutters complement each other beautifully to create just the look you want in the conservatory.